Earlier I posted about Barrack Obama running mate talk. McCain running mate talk is starting to heat up, too. According to the New York Times, McCain joked earlier about vetting VP candidates with Google. Of course, in actuality, he has a VP vetting team, led by former lobbyist Arthur Culverhouse, according to ABC News. The story says his firm lobbied congress to weaken consumer protection rights. 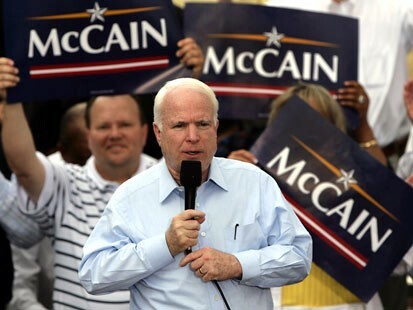 Might McCain's lobbyist ties come back to hurt him? Columnist Bob Franken, meanwhile is suggesting that McCain select NYC Mayor Michael Bloomberg as his running mate. Interestingly, Franken also suggests Obama choose Bloomberg as a running mate. Sounds stupid, but it's a good column. Read it here.